With Android Oreo, the 1Password app was meant to make the process of filling in logins easier with the Autofill API. At least that's what you guys advertised on the Play Store. However, ever since I've been using Oreo on my Note 8, there hasn't been any difference in the credential filling process with 1Password (v6.8 to be exact). I still have to manually search through my credentials and pick the corresponding one for the app. Even when I have a credential saved from the app, with the EXACT same name as the app. What's going on!? Why doesn't it work as advertised? Hi @raaomoka. Thanks for reaching out. Filling isn't based on an item's name. Instead, it's based on URL matching. The first time you fill into any app from 1Password using Autofill, you will see the search prompt. You then need to choose the Login you want to fill, and 1Password will ask if you are sure you want to fill into this app using this Login. This is to prevent 1Password filling into any bogus apps or sites. Once you've filled it, the app will be linked to the Login, and it will show up as the option for filling from now on. 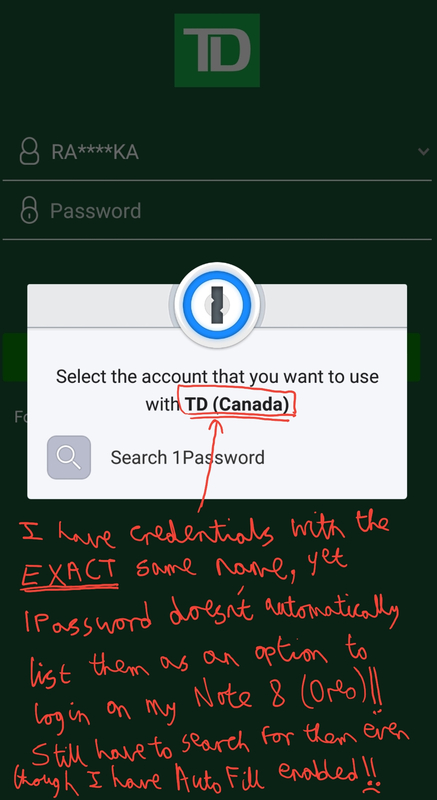 I have tried it multiple times, both with credentials synced from my Windows PC and with credentials saved by 1Password on my phone, yet 1Password still doesn't automatically select the credential when I go to fill in the app again. What's going on? @raaomoka Can you let me know what version of 1Password you have on Android and how you're syncing your data? Are you using the standalone version and syncing with Dropbox? If so, have you converted your data to the OPVault format? I have 1Password v6.8 installed on my Note 8, I am syncing via local directory on my phone, which I keep in sync between my Surface Pro 2 and my Note 8 (either via USB or SMB). No, I haven't converted my vault to the new OPVault format as that messes up my credentials; turning all my folders into tags, and there's no alternative as you guys have blatantly refused to implement multiple local vault support on Android, something that's been on iOS for years. I think there may be some confusion. As Peri mentioned, 1Password doesn't care about the name. After all, it would be trivial for a fake app or website to give itself the name of another. However, if you're using the old AgileKeychain vault format all of that is irrelevant: it doesn't have any support for newer data structures used for saving things like app IDs for filling. It was created over a decade before it was even possible to fill on Android, so you'd need to upgrade to the newer OPVault format in order for that to work. What about using the 1PW in an app, but not on a webpage, the same thing happens. Similar to this, I have to switch to the 1PW keyboard and it still won't fill -- I have to tap fill password and fill user name. The Android app seems to be going backward because it's no longer a time saver and takes more. Sometimes it fills a password and no username or vice versa; to get it to work I have to switch to the keyboard and tap tap tap.